You may think that "light" cigarettes are less harmful than regular cigarettes. They're not. Light cigarettes put smokers at the same risk for smoking-related health problems as regular cigarettes. Some cigarette packs say that light cigarettes have lower tar and nicotine. Don't let these claims fool you. Tobacco companies use smoking machines to figure out the amount of tar and nicotine in the cigarettes. These machines "smoke" every brand of cigarettes the same way. However, people don't smoke cigarettes the same way machines do. People may inhale more deeply, take longer or more frequent puffs, or smoke extra cigarettes to satisfy their nicotine craving. Smokers then inhale more tar, nicotine, and other chemicals than the smoking machine measures. Another way that tobacco companies try to make light cigarettes is by putting tiny holes in the filters to dilute the smoke with air. However, many smokers block the holes with their fingers or lips, and it's the same as smoking regular cigarettes. 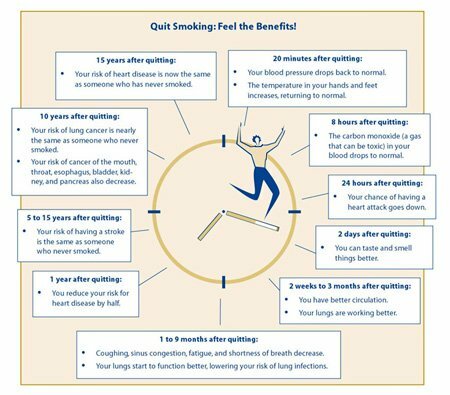 Quit smoking: Feel the benefits! Did you know that many people try to quit two or three times before they are able to give up smoking for good? Nicotine is a very addictive and powerful drug-it's as addictive as heroin and cocaine. The good news is that millions of people have given up smoking for good. It's hard work to quit, but you can do it! Pick a date to stop smoking. Plan to quit in the next two weeks. Think about choosing a special day. If you smoke at work, quit on the weekend or during a day off, so you'll be cigarette-free when you return. Get more help if you need it. Join a quit-smoking program or support group to help you quit. Personal support is critical. These programs can help you handle withdrawal and stress and teach you skills on how to resist the urge to smoke. Contact your local hospital, health center, or health department for information about quit-smoking programs in your area.